I wanted to introduce the first of what I hope will be several Chrome Experiments (prediction: all HTML5, and all music-related). It’s called Tito, and you can play with it here. What is it? It’s an early prototype for a musical instrument that uses a bouncing ball gravity model to trigger and manipulate audio samples. It’s an instrument that designed to be played as chord accompaniment for a lead instrument. You “play” the instrument by Â clicking the chord buttons on the right. Note for music geeks: 7ths and Dim notes are provided with each chord, but muted by default. Click on the notes at the bottom of the bouncing ball graphs to enable them. Ability to choose between multiple different sample sets. Option to retrigger all the balls on each chord change. Ability to position falling balls by clicking on them and letting go.Â Done! 10/21/10. Sliders for changing gravity settings. And finally, whatever features you want. @reply me on twitter (@dhilowitz). Ability to mute specific balls.Â Done! 10/19/2010. Ability to change chords. Done! 10/1/2010. Posted in Applications,Products,Web Development. 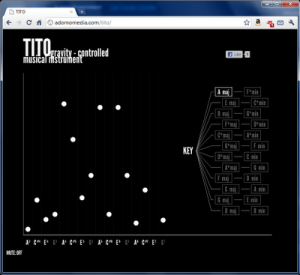 Tags: canvas tag, chrome experiments, dhtml, flash, html5, projects, tito, Web Development. There are 5 comments for this post. This is the coolest thing ever.